There are many Kanji, Japanese characters, that are pronounced the same way, but each Kanji has a different meaning. The concierge will choose a Kanji that suits you the most, after asking you some questions about your personality, and though your Kanji name, you will get to know some new aspects about yourself. Many of the customers use their Kanji name even after they go back to their home countries because the name is a unique, special one created just for them. 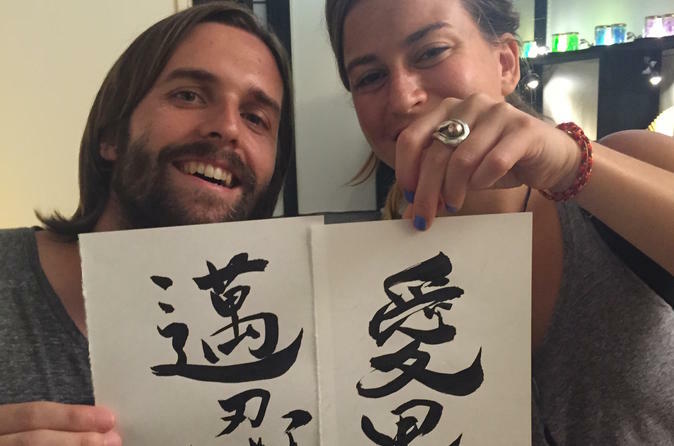 The service will make your name in Kanji, or Japanese alphabet, and write it in Shodo, or Japanese calligraphy. When you step into this shop, you will be welcomed by a traditional Japanese atmosphere and women dressed in kimonos and tell them about yourself such as your personality, hobbies etc. Then, the concierge will create your Kanji name based on the information you have given. After you have chosen a name for yourself, a professional calligrapher will write your Kanji name for you in front of you. You will enjoy seeing this traditional performance, Shodo. This paper will be then framed and wrapped in a Furoshiki, or Japanese traditional cloth. A piece of paper that explains the meaning behind the Kanji characters used for your name will be included. *This service will take around 10 to 15 minutes per person.